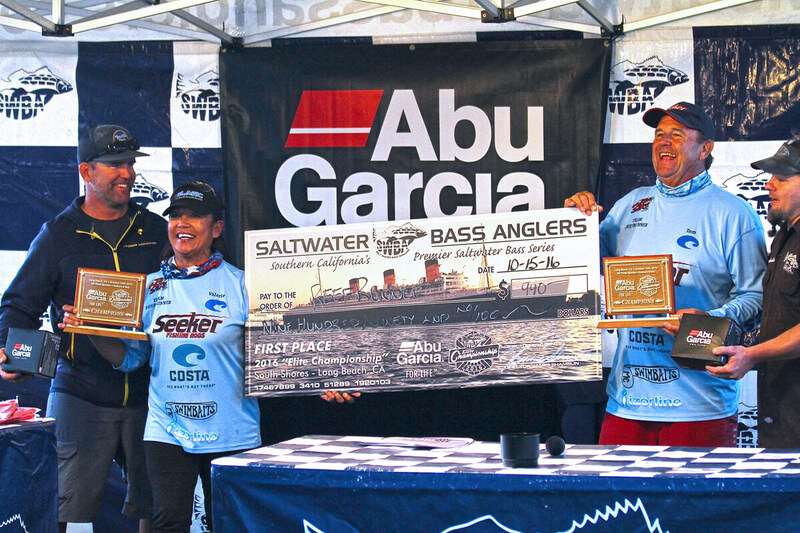 The SWBA Tournament of Champions presented by Abu Garcia saw a few new twists in 2016. 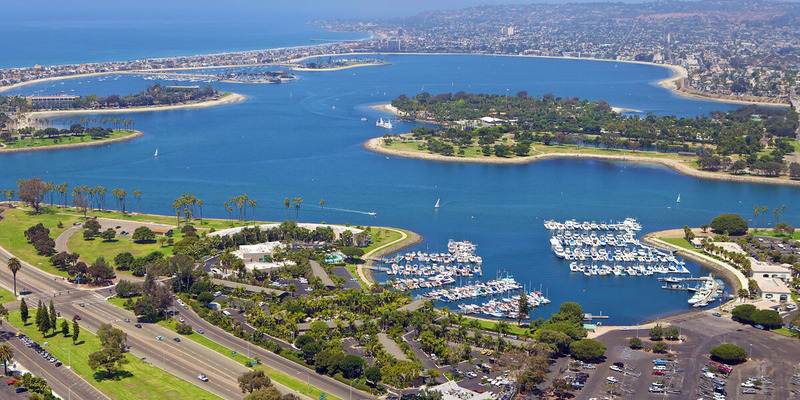 The single-day tournament held out of Long Beach CA, featured 12 hours of competition and ‘coastal only’ boundaries. 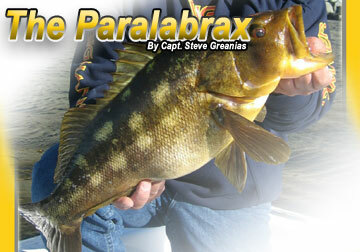 While all 3 species were allowed in this event, the real ‘wild card’ would prove to be the elusive ‘spottted bay bass’. All ‘spotties’ in the event would have their weights multiplied by 2.5, offering a very interesting dynamic that would ultimately play a big factor in many teams approach to the event. Several of the top ‘calico’ and ‘sand bass’ teams would swing for the fence, concentrating on the bigger species, and by-passing the spottties all together. 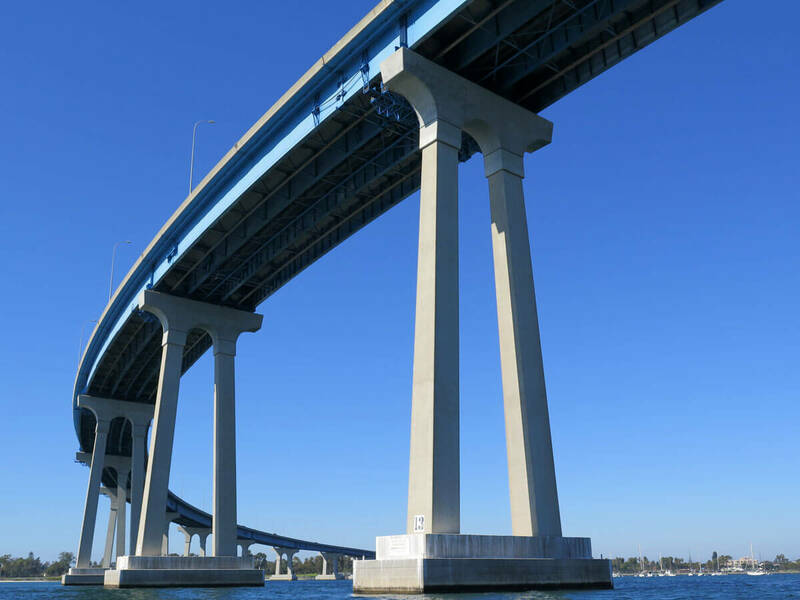 A few would make the long run uphill towards Malibu in pursuit of some big calico bass, while the remainder would run and gun the local artificial reefs, breakwaters, and structure spots, in hopes of the grumpy sand bass know to frequent those haunts. 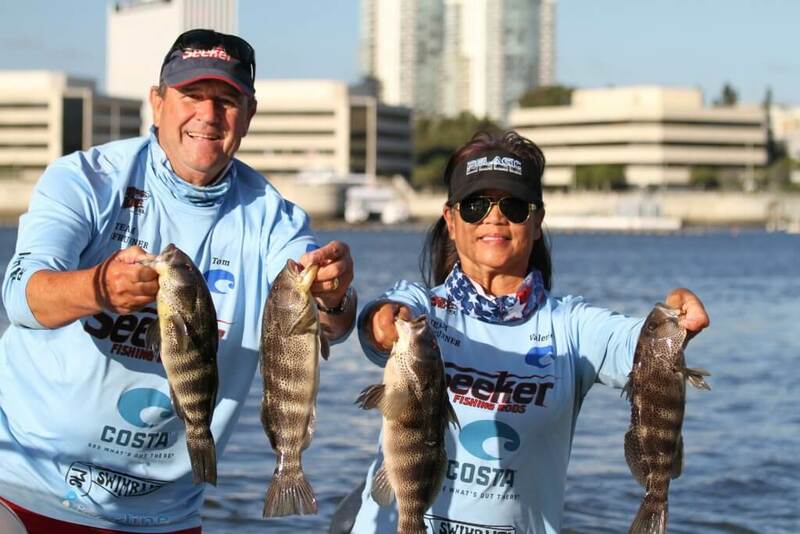 A few teams had even plans to ‘supplement’ their catch with spotties as the day progressed. Team Basstards Al Miqueliez and Rex McConnel had a limit early. 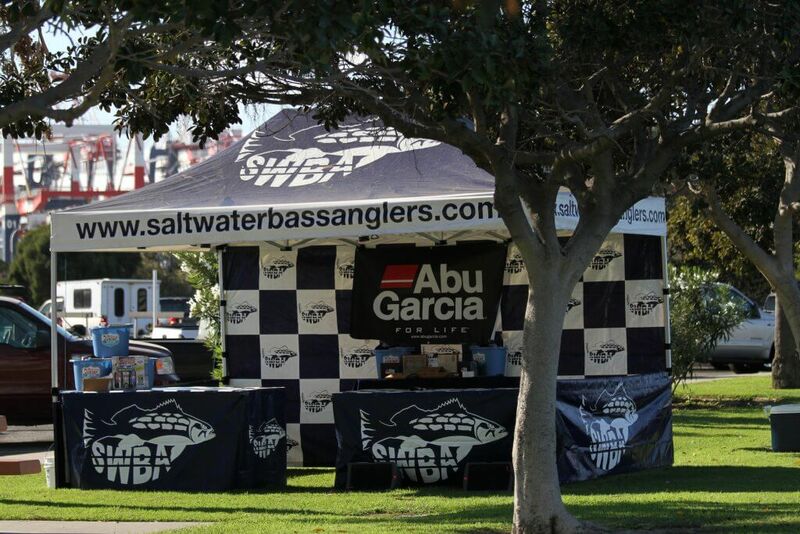 To go along with cash prizes, trophies and bragging rights, there was some great product for the top 3 teams offered from SWBA sponsors, and we’d like to sincerely thank them for all their support. 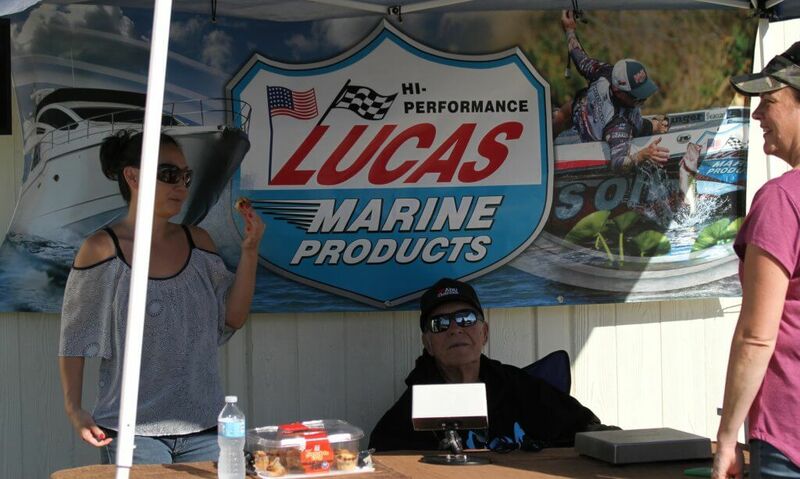 Prizes Included Abu Garcia ‘Beast’ reels, for the winners, 6 United Compostes / 310 Rodworks rod certificates, Aftco Gift certificates, Lucas Oil Marine Products, Taco Surf gift cards, Kaenon sunglasses, and Bass Underground product. After check-in and all final preparations were complete, the 21 teams lined up for the 5:00 am ‘shotgun start’ at the stern of the Queen Mary. 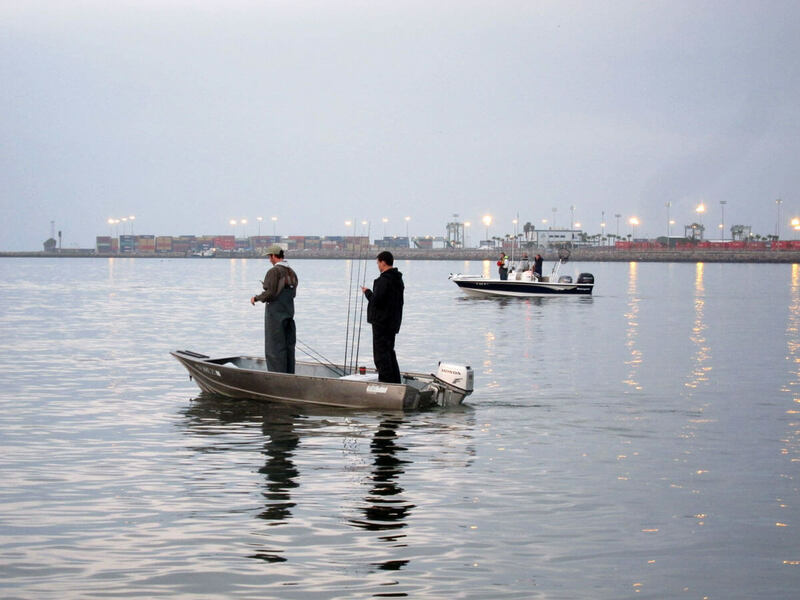 Teams sped off in every direction with the majority seeming to head south and a couple staying close to the host marina, capitalizing on the remaining darkness. Once the sun was up, we traveled through the inner-harbors, bays and marinas to check on the field. It quickly became apparent that spotties were playing a bigger factor than we had anticipated. We saw several teams in Huntington, Alamitos, and Long Beach Harbors . 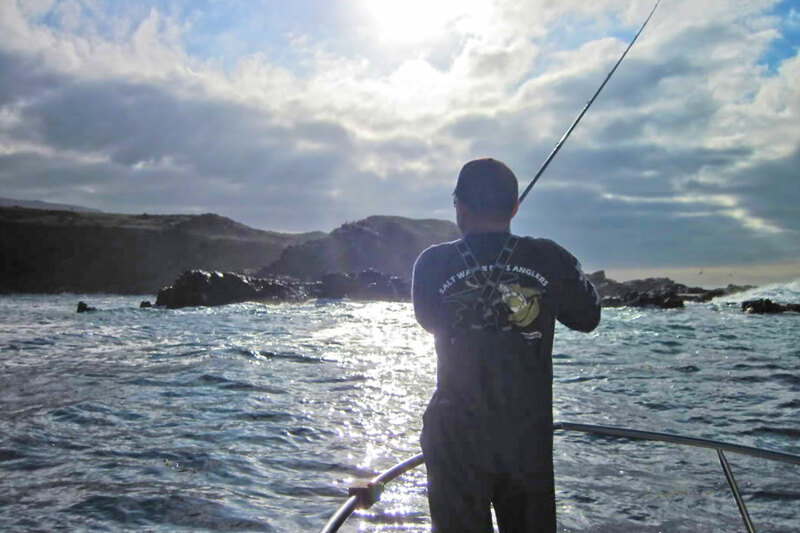 . . all in pursuit of those tough-to-catch spotties! Several teams had good success early on, with some limits coming within the first 2 hours ! Valerie Handzus was stoked early in the day. Tom Handzus kept on chuckin. Under almost a full moon, the extreme high tide peaked around 9:00 am, and once it dropped, and really turn by 11:00 am, many of the bays turned into rivers. 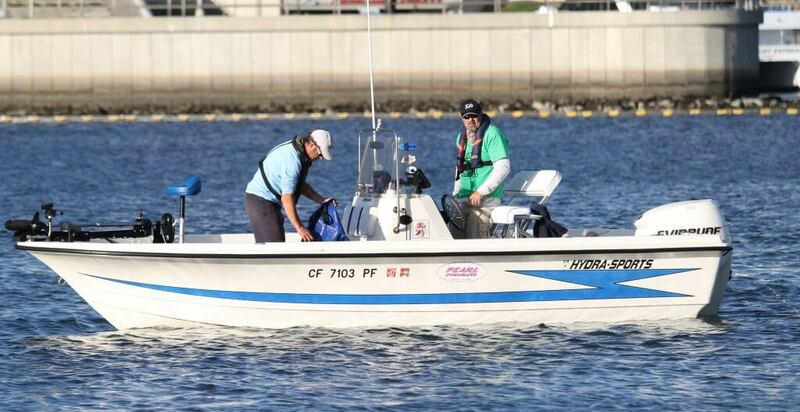 This is when we saw the most teams moving around trying to re-establish fishable patterns. We lost track of most of the teams, who had by now, spread out even further throughout the coast. The weather stayed nice right up until the last couple hours, where a stiff breeze picked up. 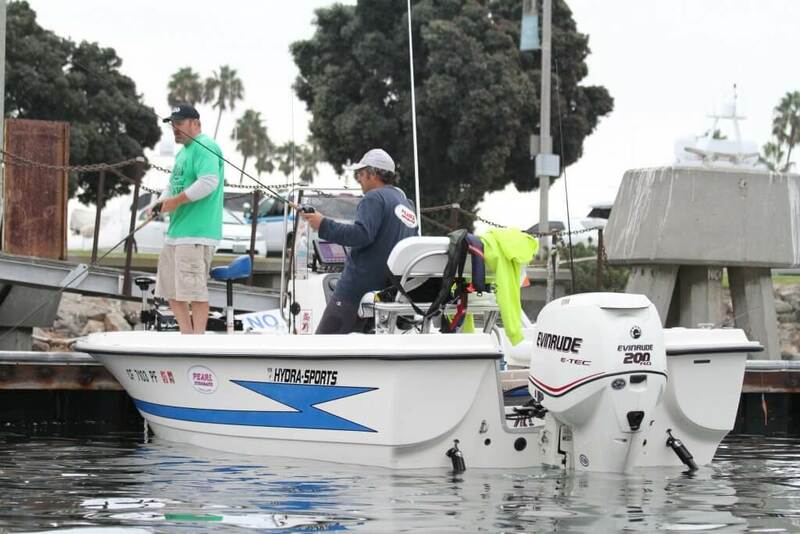 Palos Verdes bound anglers in pursuit of calicos struggled with the conditions all day, and right at the end we got word that conditions had turned around for the better, but it would ultimately be too little too late. The weigh-in station was set up early. As a few teams checked-in early, it became even clearer that the spotties may steal the show. Reports of tough calico fishing quickly became the norm. 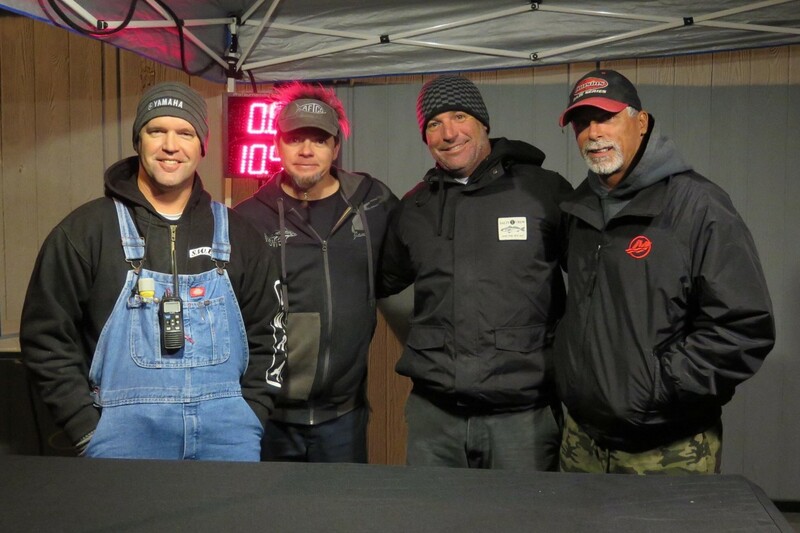 Team Basstards Rex McConnel and Al Miqueliez capitalized on the spottie bite early on in the day, and after final tabulations of their fish were complete, were sitting on 22.44 Lbs. and slid solidly them into 3rd place. Their bag included 4 spotties and 1 sand bass. Al & Rex bag ’em up ! 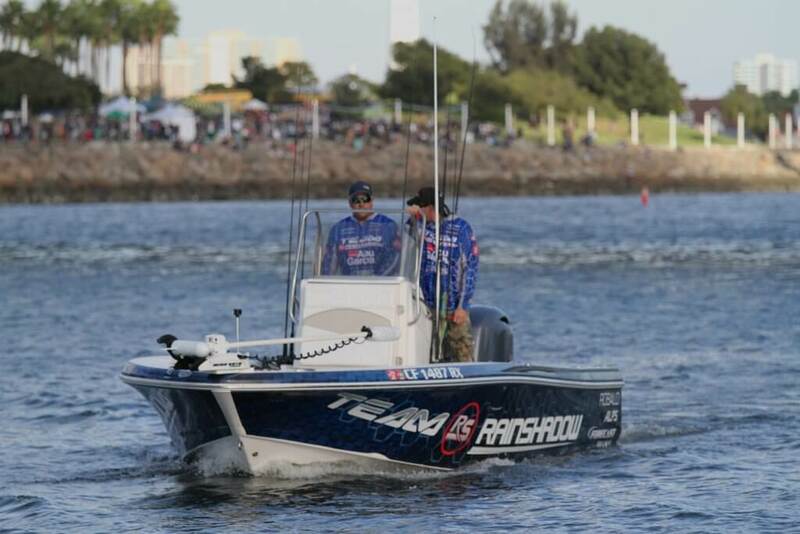 Team Rainshadow Erik Landesfeind and Matt Kotch took an opposite approach, fishing hard bottom structure spots early, then hitting Long Beach harbor for spotties. They would ultimately finish up their day at Palos Verdes. Back at weigh-in, the boys had the ‘tri-fecta’, weighing 3 sand bass, 1 calico, and 1 spotted bay bass. 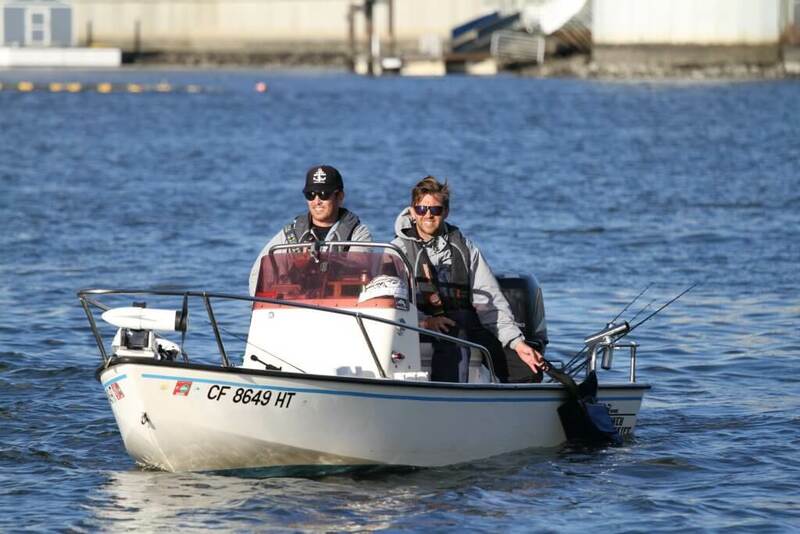 Their total weight of 23.04 Lb.s would temporarily put Team Rainshadow in the lead. Team Rainshadow worked hard, and got all 3 species in their limit. 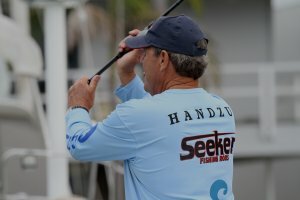 Long time veterans of the SWBA, Tom and Val Handzus had a game plan to only fish for spotties at this event. They stuck to that plan and had a solid limit in the live-well by 9:00 am. They were very happy, but knew they had to upgrade to seal the deal. They reported upgrading nicely later in the day and were sitting on an estimated 9 lbs.! 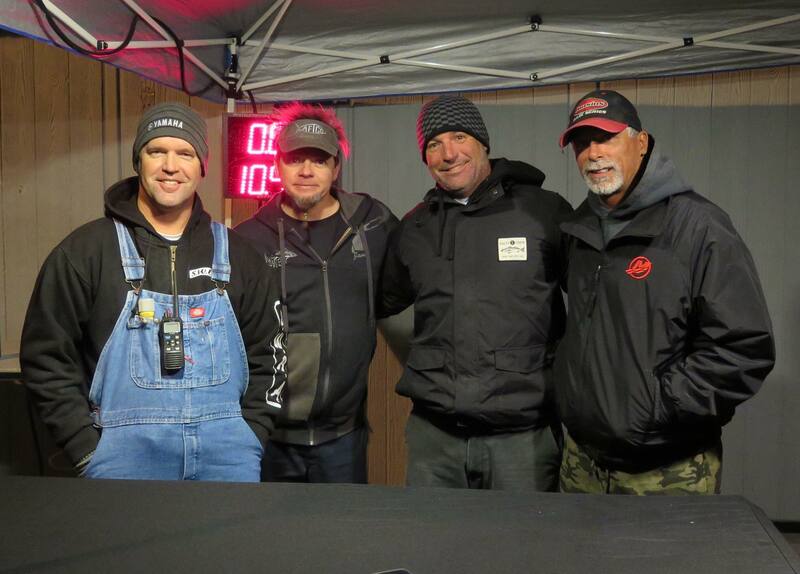 As the official tournament scale settled at 9.90 lbs. they had underestimated their weight by a little, and were now solidly in the lead with 24.80 Lbs. and very excited about their chances at the couples first ever SWBA victory. 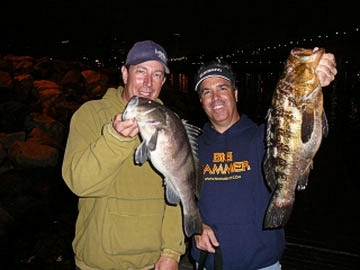 Dennis Killian and Anthony Nigro of Team I Heart Spotties walked up the scales and pulled a 2.79 Lb. spottie out of their bag. After some quick math, they would take over the lead in the Kaenon Big Bass award with 6.98 Lbs. ! But they couldn’t round out their limit and soon it was realized Team Runner would be the 2016 SWBA Tournament of Champions winners ! This was their 1st win in 13 years of SWBA competition and it couldn’t have been in finer form. Team I Heart Spotties bring the biggest fish of the event to the weigh-in ! 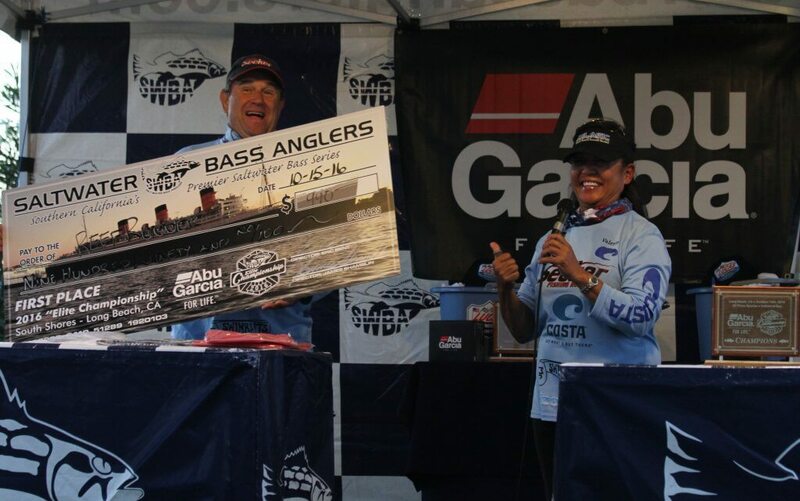 At the awards ceremony hosted by Taco Surf, Tom and Val were greeted by cheers from the entire field of anglers, who couldn’t have been any happier to see the husband and wife team finally take top honors, a fitting end to a great season ! Team Reef Runner 2016 SWBA Tournament Of Champions winners ! A special thanks goes out to all the competitors, friends, and family during the 2016 SWBA season, and to all the sponsors, we can’t thank you all enough for your wonderful support ! No Replies to "TOC Wrap Up"